Images from the National Christmas Tree Lighting Ceremony Thursday evening. WASHINGTON (AP) — President Barack Obama jumpstarted the holiday season Thursday, lighting the National Christmas Tree but also appealing to Americans to “come together as brothers and sisters” one day after 14 people were shot to death in Southern California. “This is of course the most wonderful time of the year, but we would be remiss not to take a moment to remember our fellow Americans whose hearts are heavy tonight, who grieve for loved ones, especially in San Bernardino, California,” Obama said. “Their loss is our loss, too. We’re all one American family,” he added. 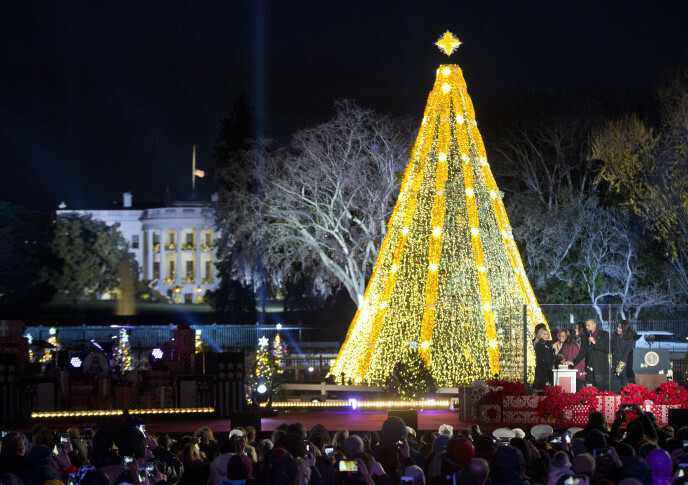 Moments earlier, the president, his wife, Michelle, daughters Malia and Sasha, and his mother-in-law, Marian Robinson, together flipped a switch and illuminated the Christmas tree near the White House. The festive ceremony was held under somber circumstances following Wednesday’s events in California. As a backdrop to the ceremony, the U.S. flag flew at half-staff atop the White House, on Obama’s orders, in remembrance of the victims. Actress Reese Witherspoon served as host. Musicians Crosby, Stills and Nash, Aloe Blacc, Kelsea Ballerini and Fall Out Boy also performed. Like this story? Read more of WTOP’s Christmas-related articles. 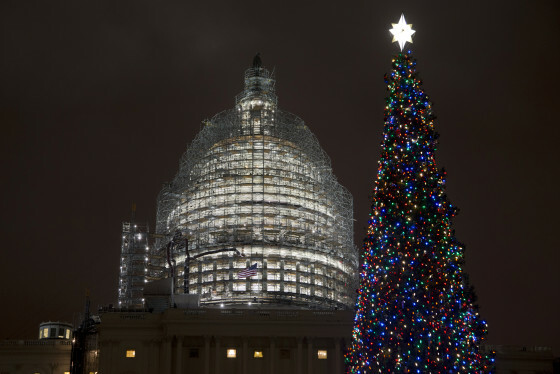 The 2015 U.S. Capitol Christmas Tree is a 74 feet Lutz tree from Chugach National Forest in Alaska. It was lit for the season Dec. 2, 2015. See photos.